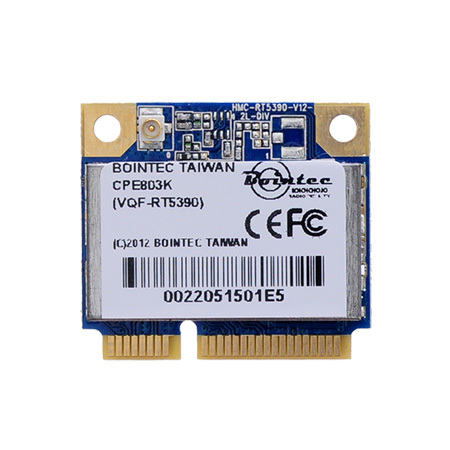 BOINTEC CPE803-K is a WLAN module supporting IEEE 802.11 b/g/n standards with 6-pin connector supporting USB 2.0/1.1 interface. This is a small form factor and low cost compact WLAN module designed for the wi rel e s s co nne ct I v I ty of0 produ cts with embedded system. This module operates in 2.4GHz ISM frequency band, it applies a highly integrated MAC/BBP and RF single chip RIS370 with 150Mbps PHY rate supporting. This module can be built-in other embedded applications such as IP Camera, IP set top box, GPS, Internet radio apparatus,it can be directly soldered on a main PCB. Bointec CUB805-K implements half-duplex OFDM, CCK and DSSS base-band processing supporting lEEE 802.11 b/g/n data rates. The MAC supports the IEEE 802.11 wireless MAC protocol as well as 802.11 i security, receive and transmit filtering, error recovery, and quality of service (QoS). CUB601-K also supports software based Wi-Fi Protected Setup (WPS). Simply enable the WPS feature from the WIFI software and your device will automatically setup the WIFI security with a compatible WPS wireless router. Setting up a secure wireless network has never been so easy. CMOS single chip (RT5390) with RF (PA, LNA, T/R SW,and diversity SW), Baseband,and MAC integration. Antenna configuration: one I-PEX receptacle for external antenna. Drivers supporting Windows XP / Vista,2K, Mac OS X and Linux. Click the button below to add the CPE803K (IEEE 802.11b/g/n Wi-Fi mini PCI Express Card) to your wish list.